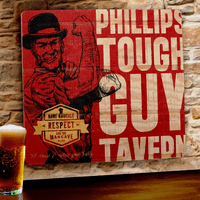 FEATURES/SPECS Do you know a tough guy whose man cave could use a little sprucing up? 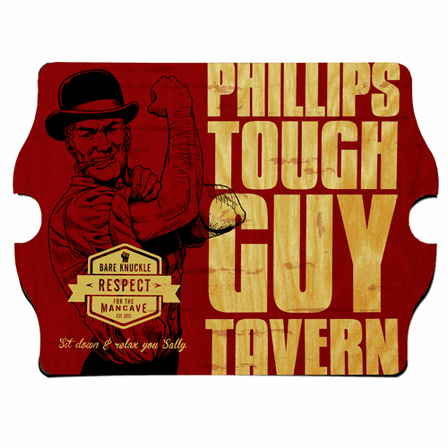 Well give him a unique man cave warming gift with this "Tough Guy" theme personalized pub sign. Made of composite wood, it features the image of a classic tough guy showing off his muscles. 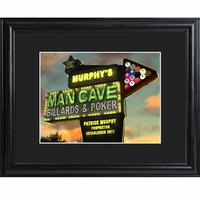 The quotes "Bare Knuckle Respect For The Man Cave" and "Sit Down & Relax You Sally" are printed front and center, letting everyone entering his man cave exactly what is expected of them. 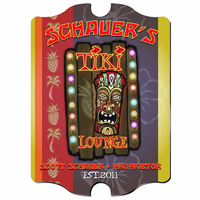 Add his name and the year the man cave was established to complete this customized man cave sign. It comes with all the hardware needed to hang it immediately.